I like this feature from redfin. I was wonder what is your opinion of the upward tread of the past few months. Is it because of people looking to buy at a good school district? From the upward trend in prices, it is obvious we have hit bottom and prices and going up up up! You had better buy now or be priced out of market forever. So what over-priced house are you trying to sell to make this comment? The upward trend is the typical Summer sell-off as families relocate, young professionals move in/out and sellers test the market. 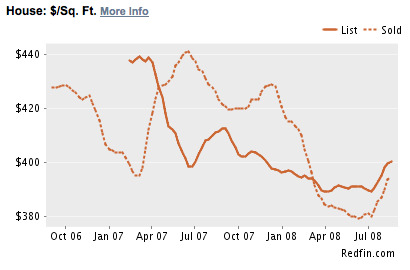 If you take a look at July 2007’s figures, there’s always a big bounce. After that, the market will continue on its current trend as both buyers and sellers take themselves off the market. 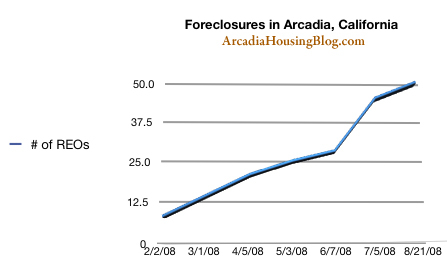 Can you post a chart compare Arcaida’s REO’s and other city or LA County? We have not hit bottom, yet. We should see price drop for another year. It’s only obvious to realtors with wishful thinking. I think the NASDAQ did this quite a few times while it tumbled back to reality. Some eager beavers like to jump the gun because they see a 25% off sign on something marked up 100%. We call them knife catchers. So that must be a knife catcher bounce. 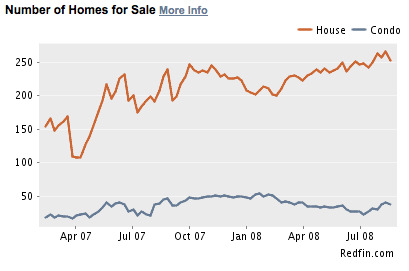 I wish posters would stop comparing the stock market with the housing market. No correlation. You can interpret into the statistics all you want but at the end of the day it comes down to affordability. I hear many predictions but there will be no return to boom times as long as creative financing is not there. 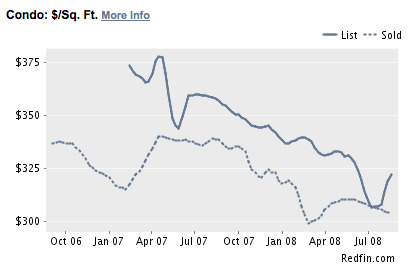 The ARMs with teaser rates fueled the boom so look back at pricing preARMs and that’s where the bottom will be…circa 2004. To think prices will bouce back 15-20% by this time next year is the height of being naive. As long as conditions like this exit there will be no recovery. In other words, we need to see prices STOP falling for a few quarters before they can go up. I’ll be happy to make the comparison. Just give me some time to collect the data.